Zhang Jike is no doubt one of the most successful table tennis players in history. He could be the two times Grand Slam in table tennis. But unfortunately, it was too hard to achieve the 2 times Gold Medal in the Olympics. In the final match, he lost to Ma Long. 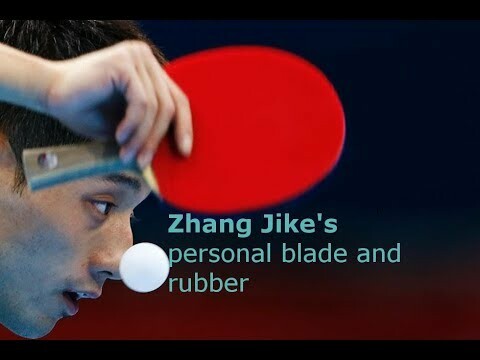 Let’s review Zhang Jike biography and his latest equipment (blade and rubber). Known as one of the best table tennis players in the world, Zhang Jike is the 4th Grand Slam Champion in table tennis history. Zhang Jike (张继科) is known as the “The Tibetan Mastiff” due to his “steel mental capacity”, and his “rebel character”. Will Zhang Jike come back? Zhang Jike, the Chinese men’s table tennis team athletes. Qingdao, Shandong, Shandong Luneng table tennis team in 2000. January 2003 enter the Chinese national team. 2010, Zhang Jike and partner Wang Hao won the Guangzhou Asian Games Table tennis doubles champion. 2013 World Championships successfully defending. Personal Information about Table Tennis Player: Zhang Jike. Zhang Jike is currently using the Butterfly Viscaria blade with the Tenergy 80 on his backhand, and a National version of Hurricane 3 Blue Sponge on his forehand. Zhang Jike is the one that popularizes the Viscaria ALC Carbon blade. His equipment fits very well the playing style of Zhang Jike: Backhand initiate attack with a high quality of spin and speed. Viscaria is considered one of the best professional blade in table tennis. Playing style Aggressive Fast Attack. Initialization with a quick backhand attack. Spinny and Powerful Forehand Loop kill. Very good footwork, and pace control. Quality Physical Strength and Explosiveness. Tough mental strength at late game. Why he needs a custom handle for his Viscaria? Because he has a special grip to improve his “micro-adjustment”. His specialty is the quality: Spin, and speed from his backhand. His forehand rubber is the National Hurricane 3 (blue sponge) (check price). He is also using the booster to tune (you can clearly see the pimple boosted on the photo). Zhang Jike’s backhand rubber is Tenergy rubbers (Tenergy 05 and then Tenergy 64). Zhang Jike, as many pro players, asked for a custom handle size that fit well his style. The blade dimension can also be ordered for pro players. Like to increase the head size to 1mm to increase the flex and the power of the forehand loop far away from the table. Or smaller head size will favorite the maneuver over the table (like the backhand flick, drop shot, or forehand quick counter). Here are the main dimension parameters of the blade. Zhang Jike has demanded a customized handle’s size. Note that, there are several types of the handle in table tennis. Zhang Jike’s handle is a larger FL handle. HI! happy you are still uploading many interesting articles! Can you please make an article/video about the evolution and the differet styles of forehand loop? Keep this amazing work coach! Hey, does anyone have any information about Zhang Jike? Without even participating in the 2019 World Championship, does he have a chance for the Olympics at Tokyo? Is he training at all?